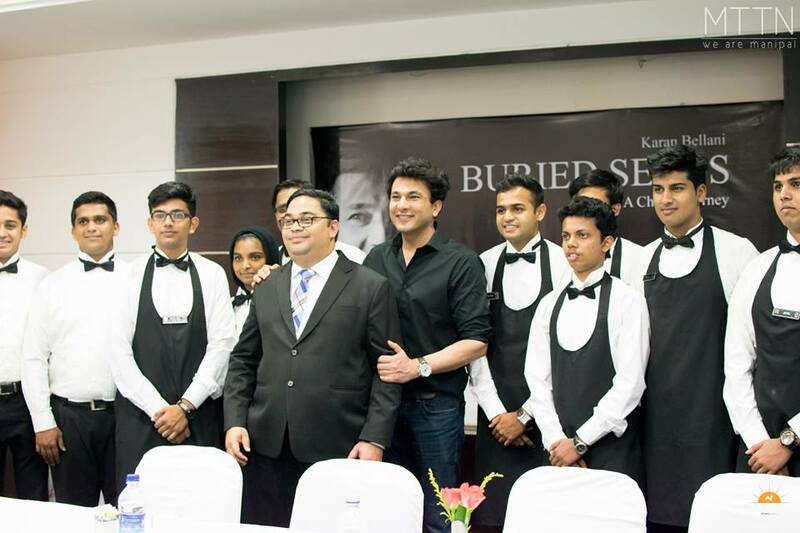 Tall, chiselled, and giving off an aura of charm, Vikas Khanna entered the hall with a sense of belonging. It was right in that hall where he recollected having his wine tasting classes. “Unless you come back to the place where it all begun, life doesn’t become a full circle”, he said while he talked about shooting the last part of his documentary ‘Buried Seeds’ at Udupi. With a radiant warmth, he joked about how coming to WGSHA during UTSAV had become a tradition. He had become used to seeing familiar faces adorn the front row of his conference each year. He was here with Andrei Severny, esteemed filmmaker, photographer, and visual artist. Andrei is the filmmaker for Buried Seeds and spoke primarily on what went on into making the movie. 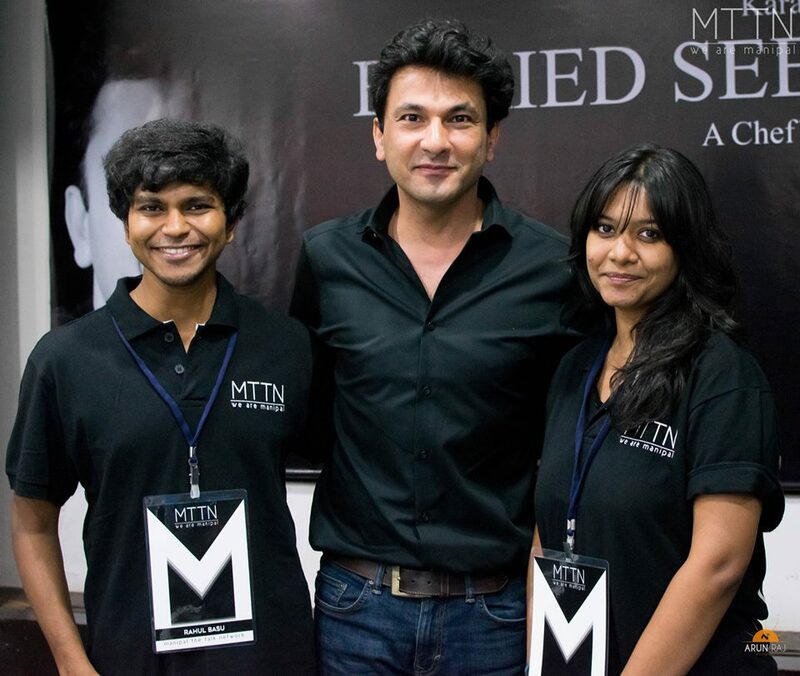 Here’s an excerpt from the interview, in which Vikas Khanna gave us more insight into his biopic, being in Manipal among other things. I am very excited about this visit. We are here to shoot the last part of the documentary. 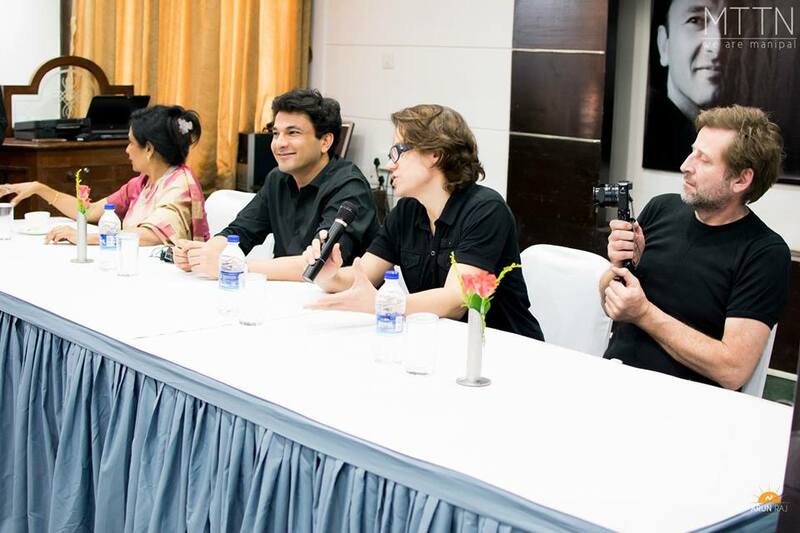 This is Andrei’s first visit to India. We are going to shoot parts at the Krishna temple, at Malpe, and all the old areas. Our purpose is to rediscover and recreate the India that our grandparents knew and loved – the India we all have grown to love. After all, the most important quality we Indians have is humility, and that is what we wish to show to the world. We are trying to show through this that even if food is not enough in Indian homes, love is enough to sustain the child. This is the message of the film. You’ll see it through and through—it is love which makes us survive. Not our social security systems, not our bank accounts, nothing external. It is simple, plain, authentic love. This is the power of the country and that is what makes us so different. What message do you wish to convey through “Buried Seeds”? Firstly, to answer your question, it is the story of resilience and hard work. Resilience, hard work, this pursuit of perfection, and belief in your abilities in spite of everything is a story that transcends all cultures. This is what comprises the first layer of the movie. The other layer involves bringing the culture of India and its economic status to the world. This is a very inspiring story not just for any chef, but for any person. It tells you that you can achieve anything in life. Nothing is impossible. The only requirement is hard work. And that is an important message which needs to be conveyed today. What convinced you to make the movie? How did you decide to shoot it? Making a movie isn’t easy. You have to outdo every single person to be there. It is one of the most competitive markets. When Andrei discussed this story with me, I was skeptical. I asked him, “Is it so important that we need to turn this into a story?” And he replied, “Yes, it is important. Because you want to have this belief to be able to tell this to the next generation.” Initially, I was also quite unconvinced with the title, ‘Buried Seeds’. ‘Buried’ is a negative word. But Andrei said to me, “every plant grows from one seed. A seed has to be buried to grow. So many times, we have to break down or push against a wall or to the bottom before we rise to the top. There has to be something so hard that it should push you.” When he explained this to me, it made more sense to make the movie. Why not name the story something more positive like “Sprouting Seeds”? Andrei: It’s been inspired by a quote by a Greek poet, ‘They tried to bury us. They didn’t know we were seeds.’ Here we are trying to convey the message that no matter what hardships you face in life, you should always have the power to come back. With the word sprouting, you always know that something positive has happened. But when you’re buried, i.e. when you’ve hit rock bottom, is when you know something could happen. Hence this title, though a little deep and dark, could work wonders. Can you tell us about your transformation from a chef to an entrepreneur? By mistake. It started with me being offered to cook for a renowned chef for 300$. And 300$ for me at that time in 2005 was too much. I made the second dish, and he said that it was not pretty. It was a plain Rajma, I remember. And then I got so nervous that I screwed that up, too. That’s when I decided– for me to be successful, I need to be self-sufficient. It was very enterprising. People keep asking me how I wrote the book. I tell them to just start writing. The only route to success is not to depend on anyone. Poverty teaches you every damn thing. People just want to be rich. I say, first learn to be poor. You will learn so much being poor that you become self-sufficient. A large part of what you spoke about today, is the Indian street food. Do you think it is a good idea to take it out to the world and make people appreciate it further? It has already happened. Indian street is already well-renowned globally. A lot of places have imbibed into their cultures and cuisines Indian street food, it’s just that they have a fancy way of displaying it. In fact, (Principal Parvadhavardhini) Ma’am just went to Doha and she sent me pictures of some exotic dishes and they’re all street food. It is very difficult to cook street food, because firstly, they run at a very low cost. Secondly, they have a very short time, and to top it all, they don’t have manpower like us. If 6 people were to work on one dish, they have very limited budgets and they have to be very competitive. Street food is the toughest in my opinion. Because you need to be able to sell a dish for 5 rupees and it should still have all the elements in it. What are the oldest, fondest memories you have of back when you were in Manipal? “Daant. Bohot daant parti thi” (Scolding! I used to get scolded a lot.) Chef Taragan is coming soon, and he’ll tell you, I barely ever spoke in English. We used to have our lectures, and I didn’t know what to say. I used to sit there nodding my head, and it was very difficult. My principal took a chance with me because he felt that even though I wasn’t proficient in English, there was something else I had and that needed to be acknowledged. I wish I could speak English like you guys back then. We were wondering if you could tell us something about the process of writing your book ‘Utsav’. The book encompasses India in its purest essence. India’s celebrations, customs, rituals, traditions and most importantly, what binds us. Every child has a small memory of Diwali, Christmas or Ugadi. As they grow older in life, these memories become more insignificant, but our brain is so intelligent, that it will remember these happy moments. During these festivals, you might’ve received a special gift, or you may faintly remember the scent of a cake being baked at home—these memories are so special that they are therapeutic. Sometimes, when you’re down, even thinking about the arrival of such festivals reminds us of fresh paint, of feasts, cooking, and of the family coming together, or the smell of new clothes. This inspired me so much. It made me feel as if the India we see is just an underlying India. There are a billion Indias and I need to capture something phenomenal because this is when India is in its truest and humblest form. This idea kept getting bigger and bigger. Then I put a Facebook post about 6 years ago that I want to know more about the traditions of India. Within an hour I had 3000 people commenting on the post. We had so many people who wanted to share their experiences of festivals and who trusted that I could do justice to their memories. I hope I have been able to do adequate justice to it. With this, he took our leave. 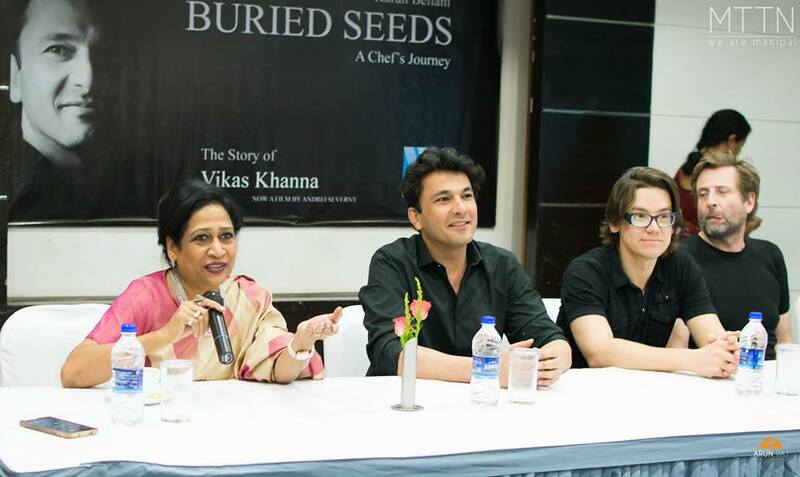 Vikas Khanna is an award winning Indian chef, restaurateur, entrepreneur, writer and filmmaker who is based in New York City. His restaurant, Junoon, based in Manhattan, USA has been awarded the Michelin star for six consecutive years. Also titled the “Hottest chef in America” by People Magazine, one of the most extraordinary qualities he possesses is humility. Having graduated from WGSHA after a series of unfortunate hardships, he is now one of MU’s most distinguished alumni. 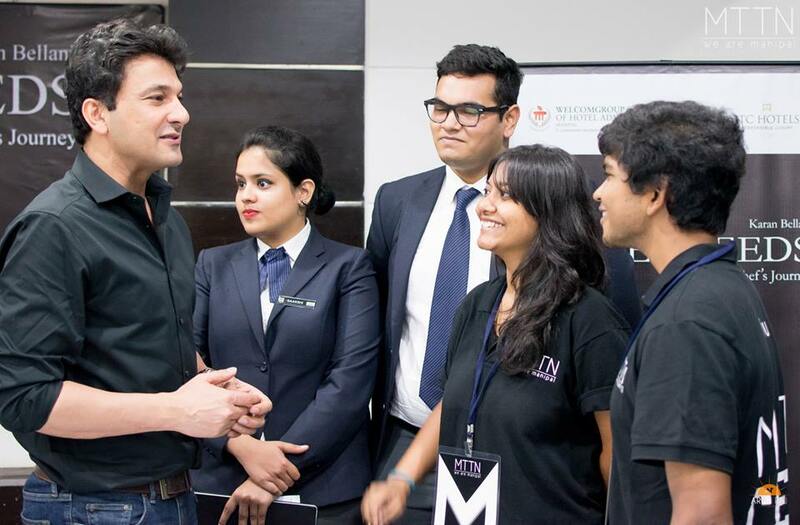 We at MTTN were honoured to have the opportunity to be able to talk to him, and really hope he comes back again with richer stories of inspiration, motivation and good food. -As said to Prattusha Mukhopadhyay and Rahul Basu for MTTN. Photography by Arun Raj for MTTN.